Added a layout of the Behrsin homestead on 4/6/10. Added a Longrie School Floor Plan ca 1938. Courtesy of Lester Hartrick, former student, to the Potpourri webpage on 9/20/2010. Added Walter Johnson's 8th Grade Certificate and Menominee Co. Journal article about 1941 Stephenson Diploma Finding Owner. Added Dorothy Loskot's Menominee Co. Normal Diploma of 1942 to Potpourri page on 1/25/2011. Miss Loskot taught at the nearby Edison School from 1942-1945. Updated pupil names on 1937 Longrie Girls class on Photo Gallery page on 1/25/2011. Picture likely 1937-38 based on teacher record, pupil attendance vs age, etc. ID also based on former pupil input, albeit somewhat contradictory. Unnamed pupils may be Thelma Ailport (far rear)& Scharlet Britten (partially hidden on teacher's left)? Please contact me if you recognize or concur on anyone! Thank you! At the bottom of the History page, I have added 'Yesterday in Longrie' which will be short paragraphs of general interest that will be added to periodically. Pictures of each student pictures are coming soon. Simply click on the 'highlighted' or 'underlined' student to view their picture. Added a picture of the Country Schoolhouse Association of America plaque bestowed upon Longrie School in 2009 in recognition of it being formally listed in the National Schoolhouse Register. 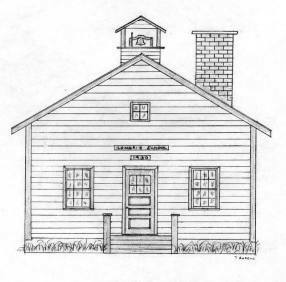 This Register lists schools determined to be significant and contribute in some positive way to the appreciation and understanding of the country school experience and their unique architectural and historical heritage. Longrie School was the first school in Michigan to be listed and one of only about a dozen schools to be included on the Registry thusfar. Former teacher Edythe Sager and student Robert Kruhmin shared in the recognition. The 1950-51 class photo was revised to include Raymond Johnston in the left row. He was omitted previously. Good catch by Jack Schmidt. Students are labeled from back to front. Added a typical school 'family index card' to Potpourri on 1/4/2013. These cards came into use in the late 1920's and remained at least until 1960. They were designed to help officials with the mass of data required by school law and administration. They were readily accessible with up to date information. Each family in the county with school age children listed in the school census, had such a card. Added the 1954-1955 class photo, courtesy Wayne & Jean (Johnson)Kuehn. Longrie School will have an 'Open House' from 10am-4pm on Saturday, September 13th.The event is open to all. Added a picture of a new hand-carved sign for Longrie erected at the location of the former Longrie home/general store/flag station for the Wisconsin-Michigan RR to the website photo gallery.